Identical row houses are stacked next to each other but am more fascinated by the walls that come alive with murals. 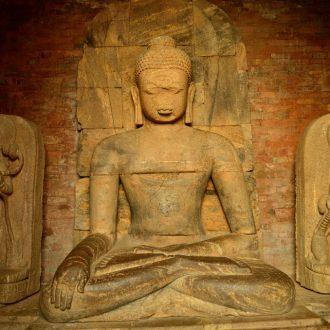 There is a lot of tribal art fused with paintings of deities and demons. 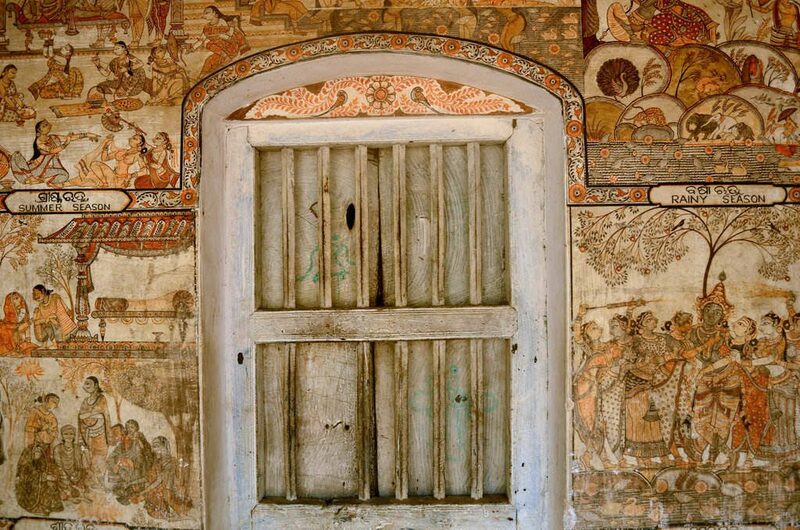 The folk motif runs as a constant thread in all the walls. 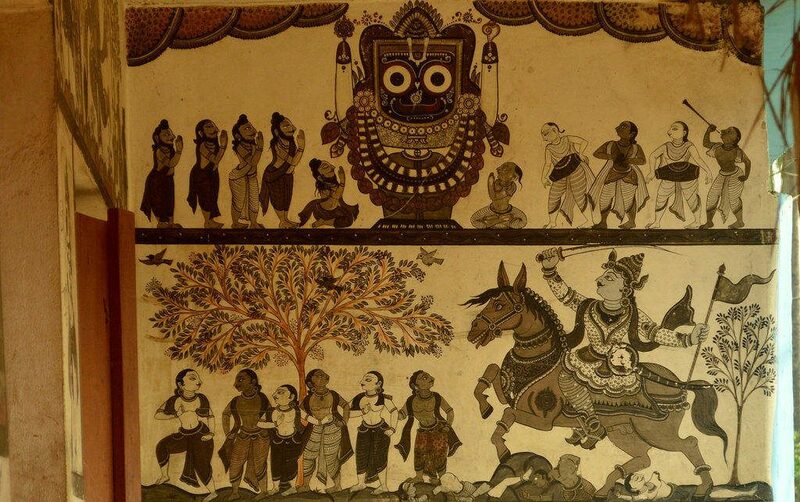 But the inspiration comes from the triad deities of Puri – Lord Jagannath and Balabadra and Sulabadra. 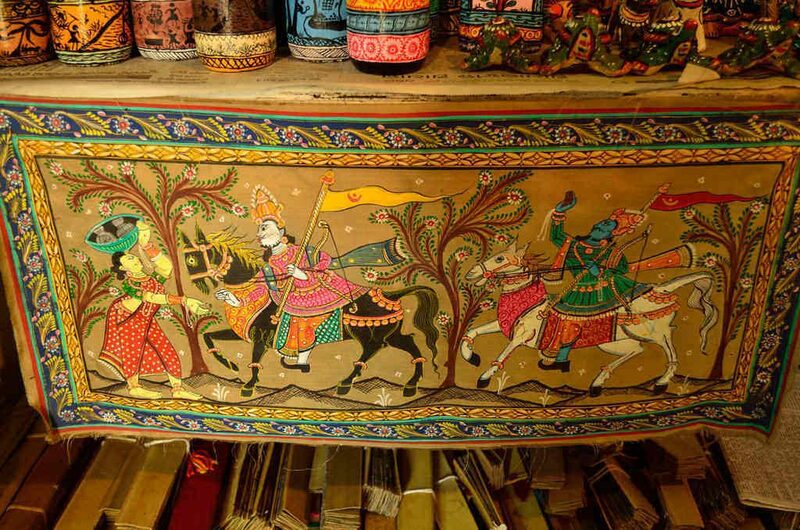 There are painted in different sizes and colours and they inspire every art and craft that is from Raghurajpur crafts village, particularly the patachitra, which is synonymous with the artists of Raghurajpur. 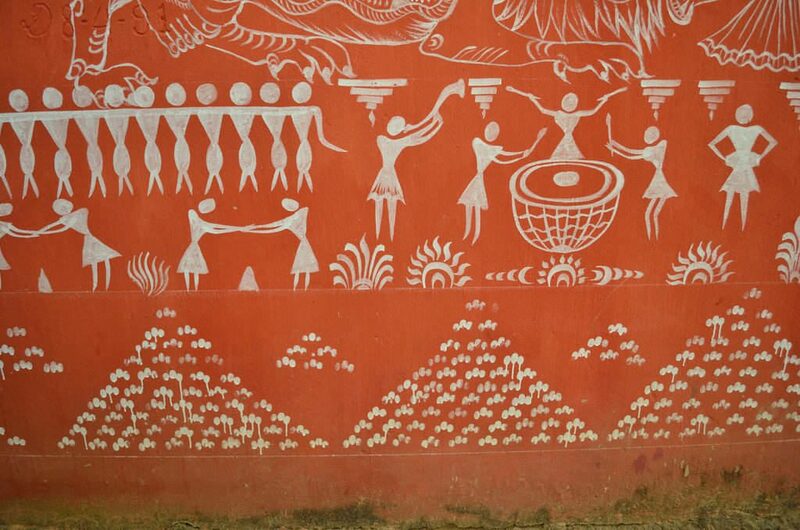 Raghurajpur crafts village is home to over 100 homes and every artist or Chitrakar has been learning the art of creating patachitra since he was a child. Walking around I see a boy sitting its in front of his house bending over a sketch while his father watches over him. I am suddenly thronged by several artists who invite me to their homes and I take turns visiting a few. Pata refers to cloth and chitra means painting is a common refrain that I hear. 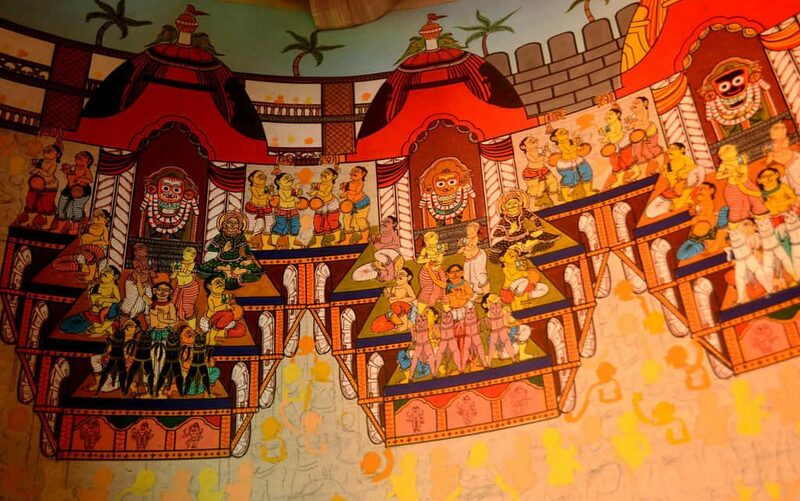 Raghurajpur Patachitra as the craft has had its origins in the traditional murals of Odisha, that date back to the 4th century. The craft has been passed on from generation to generation and every family has its own signature style of designing a patachitra. The women are very talented as well . 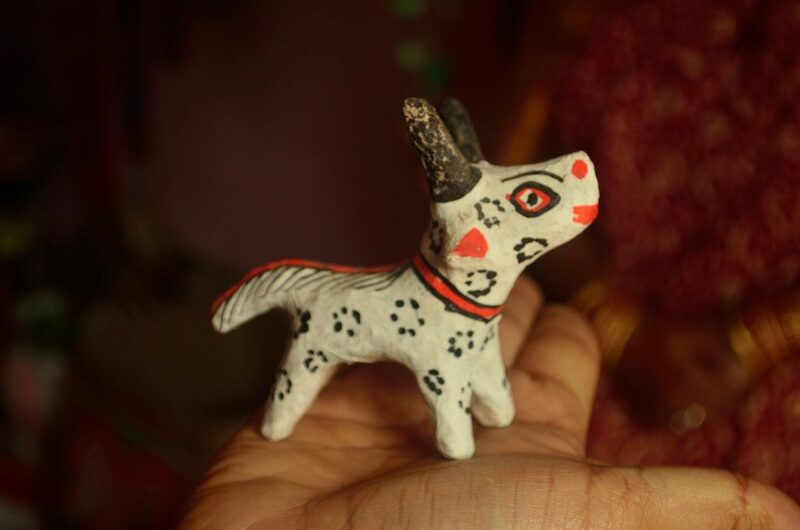 From creating tusser paintings to palm leaf engravings, they also create masks, papier mache toys and even toys made of cow dung. 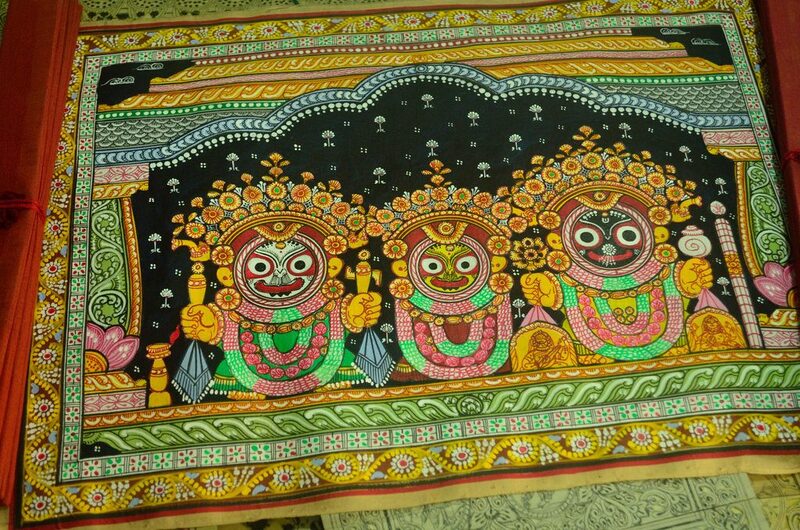 Speaking to the artists in Raghurajpur crafts village I learn that the deities in Puri Jagannath temple go on a sabbatical every year for fifteen days. Apparently the statues are then replaced with a patachitra that portrays the three deities . Every home is converted into a colourful studio. 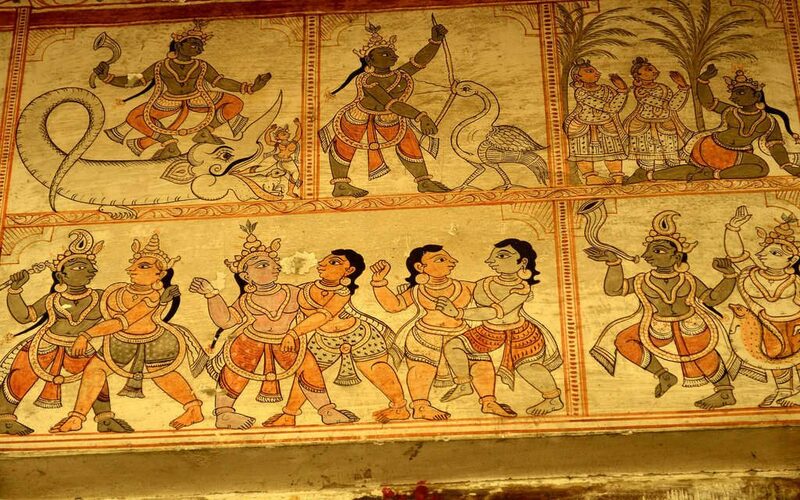 Paintings of Krishna in different forms – with Gopikas, lifting the Govardhanagiri, with his consort Radha fill the rooms. There are birds flying out of a canvas. Trees are welcoming the spring in glee. Flowers fill the landscape painted in the patachitra. 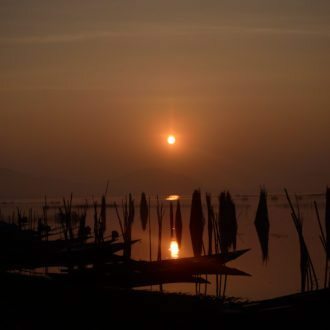 Every mood and moment of the seasons are captured in the patachitra. I get a short introduction to the making of a patachitra. 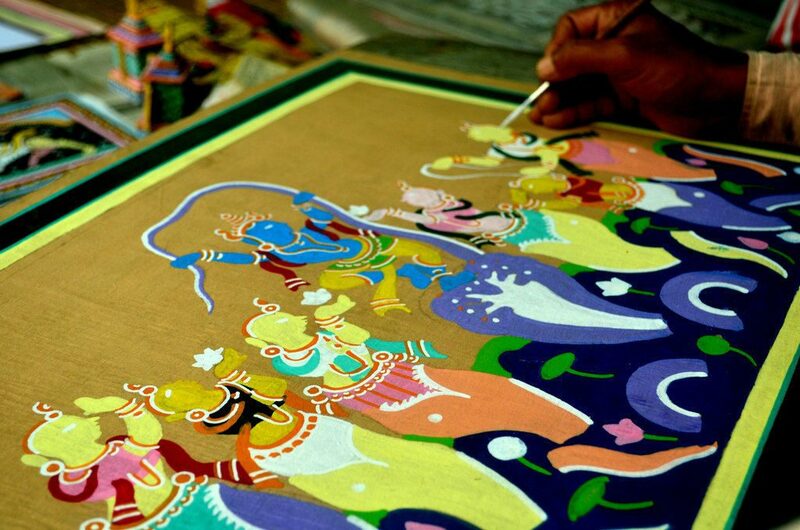 A strip of cotton cloth becomes a canvas as it is soaked in water which is filled with tamarind seeds. 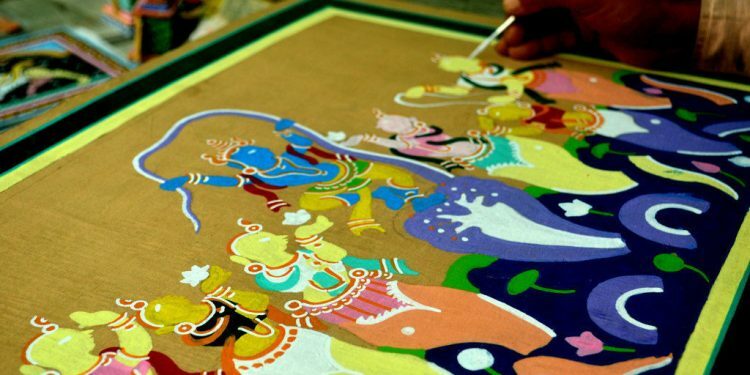 The artist then adds a coat of chalk and gum and then pastes the same with another layer of cotton cloth. He then rubs the canvas with stones so that it has a glossy finish and has a smooth surface. Some artists still use original mineral colours and vegetable dyes. But the highlight is the fine brush which is actually made of “mouse’s hair.” No pencil or charcoal is used. Eventually a lacquer coating is added to the painting to give it a finishing touch. 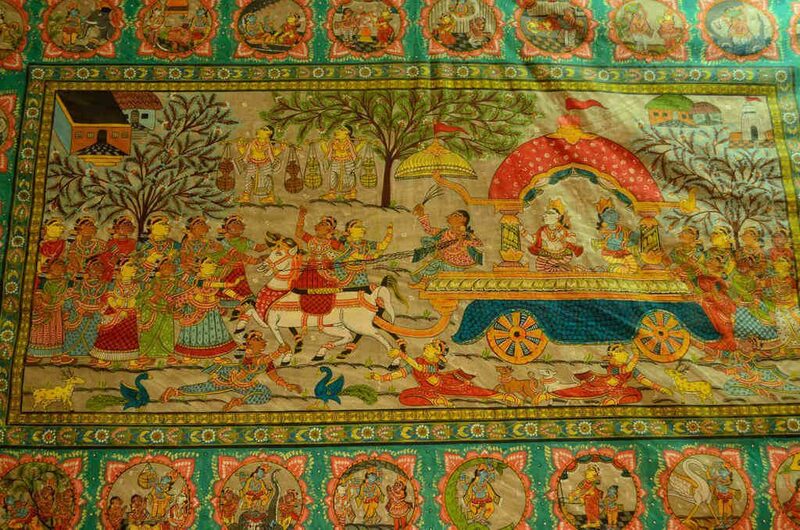 There are also dried palm leaves which are hardened and stitched together which form a strip of canvas for Dasavathaar or ten avataars of Vishnu and its called Tala Patachitra or paintings done on palm leaves. They are cut into small circular sections, opening like windows to another work of art . Each window shows you a different avtaar of Vishnu. You almost feel like the paintings are telling you a story. I potter around the Raghurajpur crafts village, visiting as many homes as possible, taking in the colours. Every artist swells with pride as he showcases his art. The women and children gather around and the families vie with each other to make me feel comfortable. As I leave a woman showcases her latest toy – a small figurine made of cow dung. As I leave I take one last look at the village and everywhere I see forms of the triad deities smiling at me. There are several arts and crafts towns and villages in India and Raghurajpur crafts village will always be special to me. What a delightful experience this must have been! The vibrant colors of Raghurajpur have fascinated me so much that I want to visit this craft village now. It is really good to see a tradition soaked over many centuries very much alive here. Whilst this kind of villages are fast becoming museums to display the work of arts and some old artists, here the life itself imbued with arts. The way of making canvas, use of ‘mouse’s hair’ brush and cow dung toys are really impressive. And, I also learnt that tamarind seeds have many different use other than arithmetical purpose. Thanks for sharing the beautiful pictures and informative writing. God bless. I am fascinated by Patachitra. I am visiting Orissa during second/third week of Nov’17. I will definitely visit Raghurajpur and would like to buy some patachitras. My niece also an artist told me that paint made out of semi precious stones are available in Orissa. Just wanted some pointers where I can buy the semi precious stone paints.